A Phoenix-area facility temporarily closed last week after the death of a fourth dolphin in its care, a case that highlights yet again why marine animals should not be held in captivity. Dolphinaris Arizona closed on Friday and there are no immediate plans for reopening the facility, according to the Associated Press. The facility’s decision to shutter for the time being comes on the heels of the death of a 22-year-old dolphin that was on loan to Dolphinaris Arizona, the latest in a string of disturbing, premature dolphin deaths. An 11-year-old dolphin died in December at the facility from what was said to be a chronic illness due to a parasite called Sarcocystis. 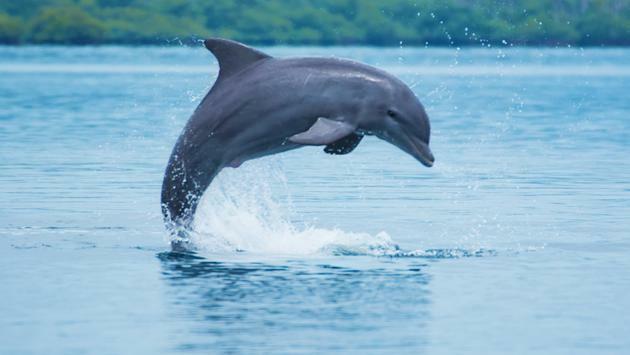 The dolphin suffered from the illness for six years. After hearing news of the latest dolphin death, more than 100 protesters gathered outside Dolphinaris on Saturday, calling for its closure. But the real answer to this problem is that dolphins should not be kept in captivity. That is the true “long-term solution.” At least the most humane one. Perhaps it is time to start publicly talking about this fact and acknowledging it. The PETA website goes on to note that wild orcas and dolphins are used to living in large, complex social groups and swimming vast distances every day in the open ocean. “In captivity, these animals can only swim in endless circles in tanks that are the equivalent of bathtubs, and they are denied the opportunity to engage in almost any natural behavior,” says PETA. Captive dolphins are also often housed in incompatible groups, and because of the cramped conditions of their enclosures, are unable to escape conflicts. In addition, dolphins are often torn away from family members when shuffled between parks. And perhaps most telling, the PETA website notes: Most die far short of their natural life spans, much like what has happened in the case of Dolphinaris. “PETA urges the facility to do the only that that’s right for the surviving dolphins – move them at a breakneck speed to a seaside sanctuary, as the National Aquarium is doing, rather than flying them to yet another marine park for no life at all in a concrete tank,” Reiman said. The organization also opposes swimming with dolphins, another popular travel industry activity. While most people have good intentions when they go on excursions or visit parks that allow for swimming with dolphins, there are many reasons to avoid such offerings. As PETA notes, the dolphins used in these programs are sometimes illegally captured and sold to parks around the world. “Dolphins are torn away from their families in the wild—even babies, who typically stay with their mothers for three to six years,” says the organization. And perhaps most horrifying, many of the dolphins who are deemed less “attractive”—and, therefore, less profitable—are slaughtered during the capture process, says PETA. For those not swayed by PETA's take on the matter, it is important to note that many others have expressed criticism of programs that keep dolphins in captivity. The death of a four-year-old bottlenose dolphin named Nea at a Chicago zoo several years ago led some biologists to speak out about why the animals shouldn't be kept in captivity for entertainment. As part of a report in Wired magazine, biologists noted that dolphins are highly intelligent, social and free-spirited creatures, and become physically ill and mentally unstable in captivity. The article went on to note that dolphins in marine parks actually have shorter lives than those in the wild. "It would be absolutely valid to frame [Nea's death] in terms of the captive versus wild mortality rates," Lori Marino, an Emory University neurobiologist who specializes in cetaceans and primates and is a prominent critic of cetacean captivity, told Wired. Marino has also publicly stated that pound for pound, dolphins are better endowed with gray matter than most primates, falling just short of humans. Yet another researcher, Diana Reiss, from Hunter College in New York City, has done seminal work relating to dolphins, showing that they can recognize themselves in a mirror (evidence of self-awareness previously seen only in primates and elephants). Reiss has argued that treating such creatures as little more than "seafood with blowholes" is no longer acceptable and that we as a society are at an ethical impasse. While there are certainly dolphin programs that are more humane and responsible, including those that do valuable research, perhaps it's time to start considering the broader ramifications of dolphins in captivity before participating in such travel-related entertainment and attractions. Perhaps ask yourself this question the next time you consider such an attraction: Is getting your picture taken swimming with a dolphin while on vacation worth that dolphin spending its entire life in captivity? Or dooming it to a premature death?